Published 2017, BioInvasions Records 6(2):159-166. Click here for electronic access. Abstract. The Great Lakes watershed is one of the most invaded freshwater ecosystems, making early and rapid detection of new invaders critical to reduce their effects on this fragile system. The genus Corbicula, freshwater clams native to the temperate/tropical regions of Asia, Africa, and Australia, contains some of the most common and successful aquatic nuisance species in the New World. These invasive populations appear to exclusively comprise asexual clonal lineages, which hinder our taxonomic understanding. Previous work suggests three clonal morphotypes have invaded the New World—Forms A, B, and C, with Forms A and B co-occurring in North America. Here, we report on an apparently novel North American invasive Corbicula lineage recently discovered in the Illinois River, which has an artificial connection to the Great Lakes. This putative new morph was found co-occurring with previously described Corbicula morphotypes. Our main objective was to document the occurrence of this new morphotype (=Form D) and perform a preliminary analysis of its distinctiveness from sympatric Forms A and B using shell phenotype characteristics and mitochondrial (mt) and nuclear DNA markers. Results showed that the three co-occurring forms were distinguishable using shell phenotype and nuclear 28S ribosomal DNA sequences. Individuals were unambiguously assigned to one of three discrete shell phenotypes, Form A, B, or D, with Form D specimens characterized by fine rust colored rays and white nacre with purple teeth. Likewise, 28S genotypes identified three distinct morphs, with Form D differing from Forms A and B by 2–6 base pairs. In contrast, Form D individuals were distinguishable from Form B via mitochondrial markers but shared an identical mtDNA haplotype with sympatric Form A individuals. This latter result could stem from androgenetic capture of Form A eggs by invasive Form D sperm, a rare form of inheritance previously inferred for co-occurring North American Corbicula clones. Further morphological, ecological, and genomic analyses characterizing the three morphotypes are required to establish the significance of our preliminary findings. Published 2017, Molecular Phylogenetics & Evolution 107:191-208. Click here for electronic access. Presented at the American Malacological Society, 17-21 July 2017, University of Delaware, Newark, DE. Abstract.Conflict Clade Analysis (CCA) is intended to minimize the need to illustrate the multiple trees that might result from exploration of data partitions or phylogeny reconstruction methods based on the view that mere resolution of an alternative topology without branch support need not always merit concern. CCA compares the branch support of all the clades among alternative topologies to a reference tree and results in a list of clades that are 1) well-supported among alternative trees (e.g., bootstrap ≥70, posterior probability ≥95), but 2) not well supported in the reference tree. CCA highlights where individual analyses differ, and the results can be presented as a concise table rather than multiple tree figures. CCA is implemented as a Python script using PAUP, RAxML, and Mr. Bayes text files as input. The previous version of CCA did not allow for missing taxa. That is, all taxa needed to be represented among the topologies to be compared. The current version allows for comparisons among clades even if taxa are missing by joining pruned alternative topologies with either the largest or smallest consistent reference clades. 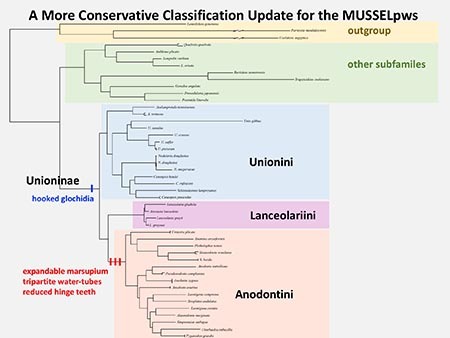 As a demonstration of the utility of CCA (as well as potential shortcomings), the phylogeny of the freshwater mussel subfamily Unioninae was analyzed using four separate gene fragments obtained from Genbank: COI, 16S, ND1, and 28S. Only COI was shared among all included terminals, and individual and combined partitions were analyzed under parsimony, likelihood, and Bayesian criteria. Results will be used to discuss the phylogeny/classification of the Unioninae. This slide shows how classification will be updated to reflect the results of this analysis (based on data from Lopes-Lima et al., 2017). Poster presented at the University of Wisconsin Stevens-Point College of Letters and Sciences Undergraduate Research Symposium, 5 May 2017. Abstract. The freshwater mussels of Mexico and Central America have not been revised in almost 100 years, and as a result patterns of species richness in the region are poorly understood. The objective of this project is to document freshwater mussel species diversity in the region based on museum specimens. Specimen records were obtained from 17 major museum collections in North America and Europe. The current analysis is limited to Mexico and adjacent Guatemala. All records were digitally photographed, a preliminary identification was attempted, and specimens were georeferenced as precisely as possible based on original locality data. Each record was also assigned to an ecoregion (when possible). To-date, 963 records have been georeferenced from 17 ecoregions (104 could not be assigned to an ecoregions); 78 species are represented (23 records were not identified). Sixty-one species (78%) are endemic to 1 or 2 ecoregions. 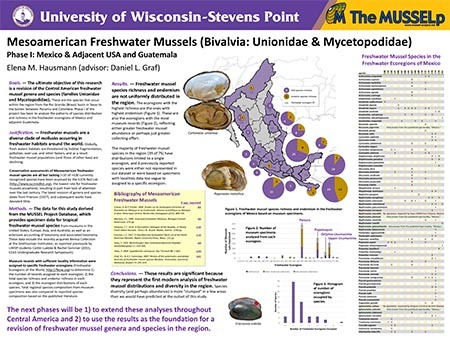 These data will be used as the basis for conservation assessments and a modern revision of the Mesoamerican freshwater mussels. Click here to download a high resolution version of the poster. 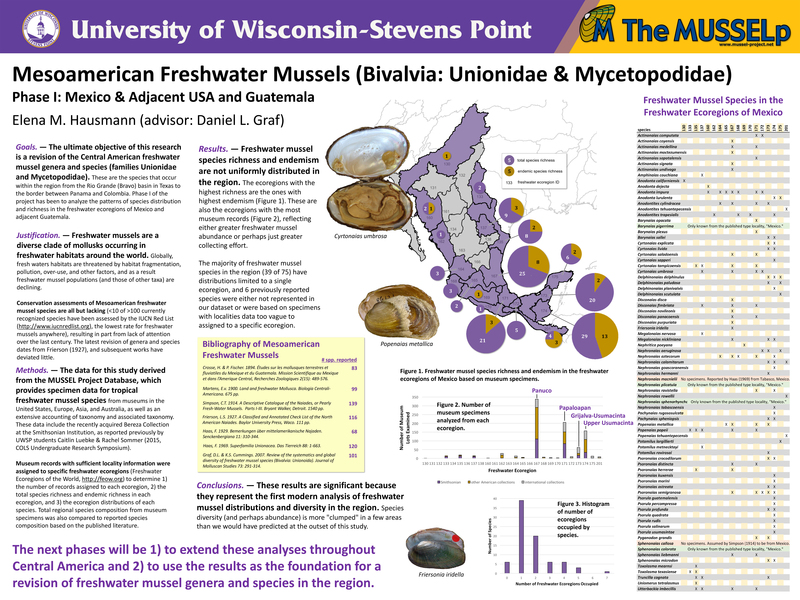 Poster presented at the Biennial Freshwater Mollusk Conservation Society Symposium, 26-30 March 2017, Cleveland, OH. Abstract. 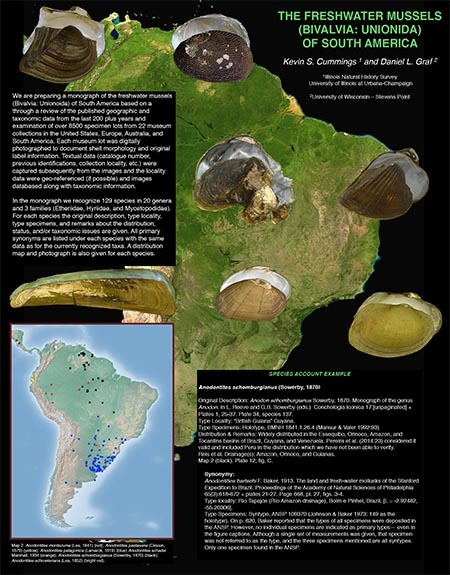 We are preparing a monograph of the freshwater mussels (Bivalvia: Unionoida) of South America (projected publication date – 2017) based on a through a review of the published geographic and taxonomic data from the last 200 plus years and examination of over 8500 specimen lots from 22 museum collections in the United States, Europe, Australia, and South America during the period from December 2002 to November 2015. Three additional South American collections were queried on‐line for holdings. Each museum lot personally examined was digitally photographed to document shell morphology and original label information. Textual data (catalogue number, previous identifications, collection locality, etc.) were captured subsequently from the images. Locality data were geo‐referenced (if possible) and images were databased along with taxonomic information. To date, we have captured data on over 8500 lots from South America. The continent is inhabited by three families of freshwater mussels: Etheriidae, Hyriidae, and Mycetopodidae. In the monograph we recognize 127 species in 20 genera. All species are arranged alphabetically by family, genus, species, and followed by the author and date. For each species the original description, type locality, type specimens, and remarks about the distribution, status, and/or taxonomic issues are given. All primary synonyms are listed under each species with the same data as for the currently recognized taxa. A distribution map and photograph is given for each species. For direct comparative purposes with fishes we used the South American natural drainages proposed by Reis et al. (2016). The large basins were consolidated as a single basin unit in addition to adjacent coastal drainages historically connected, whereas smaller coastal basins were grouped together based on proximity and geography. These regions approximate those of Graf & Cummings (2007) and both were based on “Freshwater Ecoregions of the World” proposed by Abell et al. (2008).